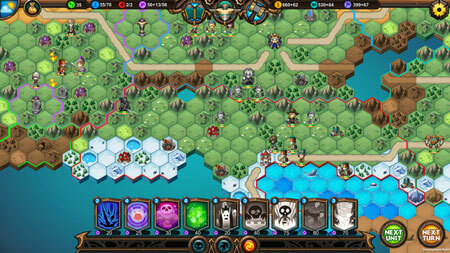 Legion War is a fantastic 4X strategy game from Bear & Cat Studio. As the leader of the legion,you must build your own castles and territory, explore the unknown lands, search for mysterious treasures, cultivate your own heroes and troops, exterminate other legions, and defeat the god who rules the world. There are three legions in the game – balanced Human legions, crafty Undead legions, and advanced Steam legions. Each legion has its own unique 3 heroes, 9 units, 9 spells and a series of special knowledge card. Heroes are the core of your legion. Each legion has 3 unique original heroes, and you can also upgrade some units to heroes through knowledge cards. Each hero gets a different upgrade talent in each game. Each hero can wear six pieces of equipment. Units are the main part of your legion, they are quite important for exploring the world, finding treasures, and defeating enemies. Each legion has 9 unique units, and if you occupy a mercenary camp or a sea castle, you can recruit a variety of neutral units or Marine units. Hammer resource are used to upgrade your units, which are effective for all units of that type. You can completely customize your combat units in the game. Each unit has its own independent talent tree, through which a unit can be developed into different functions. You can also consume Hammers to equip a unit with 3 different parts. Each legion has its own unique 9 types of spells, casting spells consume magic resources. Most of the spells can attack your enemy or assist your army, and besides, some spells has some magical effects. Knowledge resources are used to unlock the technology card, each slot can be inserted into knowledge cards with corresponding level. Most knowledge cards are public knowledge cards, and each legion has its own unique knowledge cards. Knowledge cards can increase your economic output, increase units’ power, or reinforce your spells. The maps are randomly generated by algorithms to ensure that each game has a new experience. There are five different types of maps – Pangaea, Great Plain, Mediterranean, Islands and Ring Continent. Each game map supports up to six legions playing together. There are 4 kinds of resources in the game – Gold, Knowledge, Hammer, and Magic. Each resource can be obtained by occupying the corresponding resource building on the map, besides, building in your castle can also produce specific resources. There are 2 celestials in the game. If you occupy an altar on the map, you can pay tribute to one celestial and get magic from him. Paying tribute to a certain celestial will cause the antipathy of another celestial. When he can’t stand it, he will order his troops to attack you, or even in his own. You can spend Golds to build new buildings or upgrade old ones in your castles and sea castles. Each castle has 1 main building slot and 8 secondary building slots. There are hundreds of random events in the game, and different events will bring unexpected changes to the process of game. If you get stuck in the game, check out the video walkthrough and gameplay for the game. This entry was posted in PC Games, Walkthrough and tagged Legion War Cheats, Legion War Gameplay, Legion War Guide, Legion War Strategy, Legion War Tutorial, Legion War Walkthrough by Marvin. Bookmark the permalink.